The Dimplex 2kW Toluca Deluxe Wall Mounted Electric Fire is a contemporary electric fire with built-in Bluetooth speaker. The Dimplex 2kW Toluca Deluxe Wall Mounted Electric Fire offers a fantastic array of coloured visuals in a beautiful glass wall fire. Easily controlled by the remote control, you also experience a brilliantly concealed 2kW electric fan heater. 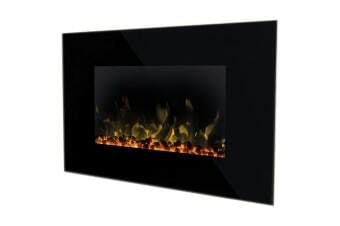 Enjoy the sound of crackling fire or your own music while adding visual flair to any room – by combining realistic, colour-changing Optiflame visuals and a matching coloured backlight. Choose between rough cut diamond pieces and a pebble fuel bed to complement any living space.